Two books from March 18, 2015. Plus a Second Opinion, featuring questions answered by a different listener each week, with Aaron Meyers. Whaaaaaat? Yeah, you read that right, Aaron is doing a Second Opinion, which means Andrea's co-host is...her 9 year old son Avi. Truth. 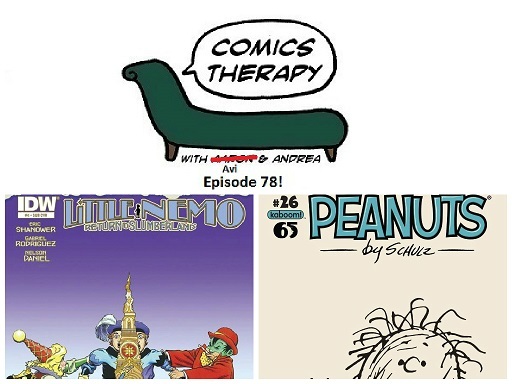 This week we’re talking about modern mythologies and the way comics today often lift classic character tropes from literature and repackage them for new audiences. Wait. Seriously, mommy? This is what you do with Aaron every week? Can’t we just talk about the comics? Your intro and outro this week were also picked by Avi. And you have to admit, Aaron, that he did a really great job with the intro especially. Chances are pretty good we'll be off next week, since both Andrea and Aaron will be in Seattle for Emerald City Comicon. See you there!